Well, it has been a while since I last blogged. In my defence, I have been ridiculously busy since Christmas. New job, two novels to write, readings to prepare. I did promise to keep you updated on the double book chase so here goes. Familiar Friend is lagging well behind at just 8850 words for the moment. This is mostly because I want to take my time with this book, make it as good as I can. I'm waiting until I have more time for it. Departure Dan, though, has taken on a life of his own. I've been quite surprised how the story, planned chapter by chapter from day one, has decided it knows better than me where it should go. I always find there is a moment in writing a novel when everything begins to slot together, and make lots more sense than you thought it ever could, and I've found this moment feels closer on this first draft than it ever has at this stage with my previous books. I'm writing at a rate of knots right now, and have got about 15000 words down in the last few days. Altogether now, I have just under 40 000 words, about half way there. 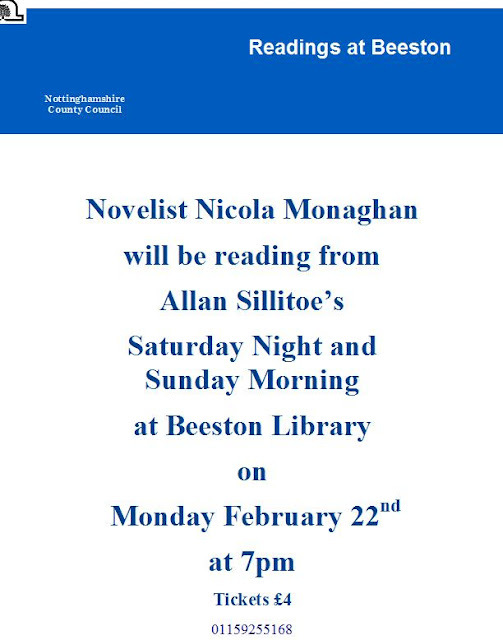 My next event is at Beeston Library next Monday, 22nd February, where I will be reading from one of my favourite books of all time Sillitoe's Saturday Night and Sunday Morning. See the flyer below for more details. Right, back to Desperate Dan. I mean Departure Dan... That book I'm writing anyway.